One of the biggest problems with Disney’s stage adaptations of their popular films is how to make an evening length musical out of a 70-minute movie with a handful of songs. The Lion King has been the most successful with the challenge, complementing Julie Taymor’s concept of telling the familiar story through her version of native theatrical traditions by filling the evening with wonderful music evocative of “the pride land”. 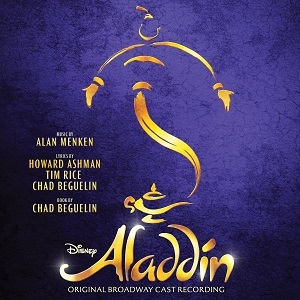 The concept behind Broadway’s Aladdin seems to be “show biz razzamataz” and the score is filled with, well, filler. While some of the new ballads are pleasant enough, they are almost uniformly inferior to what’s in the movie and frequently feel redundant. Only the earnest “Proud of Your Boy” brings added dimension to the story. The added Musical Comedy(!) numbers are perhaps effective in the theater, but come off as asinine on disk. Even great opportunities–an “I want” song for Jasmine, a villain’s manifesto–seem squandered when the results pale in comparison to their analogs in the Disney song catalog. On the bright side, the songs that are good sound great with lush orchestrations and a capable cast. Hawks Test Report Card: While there a many great numbers, there are quite a few clunkers in the new material that, for me, prevent this incarnation score from truly succeeding.